Jax is a big helper. He loves to be involved in everything we are doing. So, today I thought it would be fun if we "cooked" something. So we drug his table into the kitchen and went to work. Jax likes to help pour ingredients into a bowl. Stirring is fun too, though keeping everything in the bowl is a challenge. But he is a guy after my own heart, because tasting is his favorite part! He really enjoyed our playdough adventures. Jax is really into choo-choos right now, so we made him a train. He quickly ate the smokestack right off! It was nice to have something we could play with and he could taste without me having to tell him no. We made a mess, but we had so much fun! What a great idea, Carlee! Sounds like delicious fun to me! Enjoy the rest of your week! We really had a lot of fun! And surprisingly the mess wasn't all that bad. Umm... I would probably eat it before my kid had a chance to play with it! It looks like lots of fun! Thanks for sharing at Idea Box! It was really tasty!! Thanks for hosting! Uhh, I may or may not need to make this just for me! I wouldn't blame you if you did! Thanks for stopping by! Thanks for posting on the Wednesday Homestead Blog Hop. I hope we see you there again today. I have to admit I liked it pretty well myself ;-) Thanks for stopping by! It might have tasted too good though, we spent as much time tasting as playing!! We really enjoyed it though. Thanks for hosting! Peanut butter and chocolate playdough! Sounds like something I would eat. Thanks for linking up and sharing with us at Funtastic Friday. Hope to see you again this week. It is pretty good! Thanks for hosting! How fun is this! Who cares about the mess, really when you get those kinds of smiles! Happy Throwback Thursday! 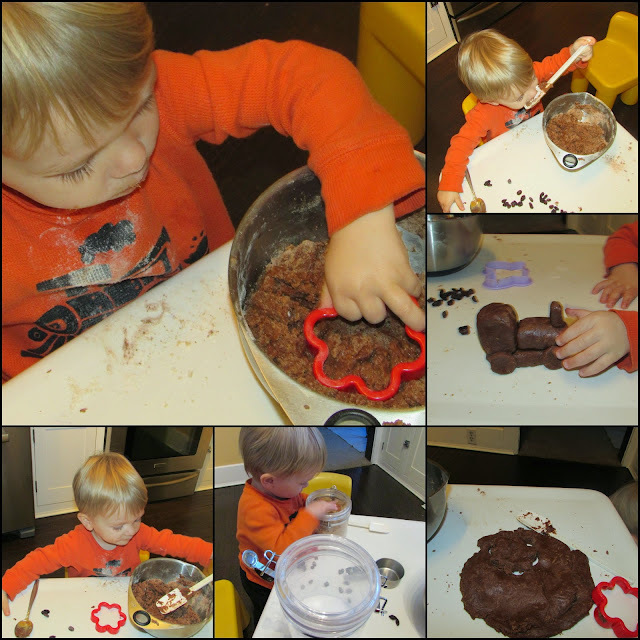 He loves to help in the kitchen, so it was fun to make something he could really dive right into! Plus if we didn't like what we designed, we could just eat it!